It's that time of the week again! 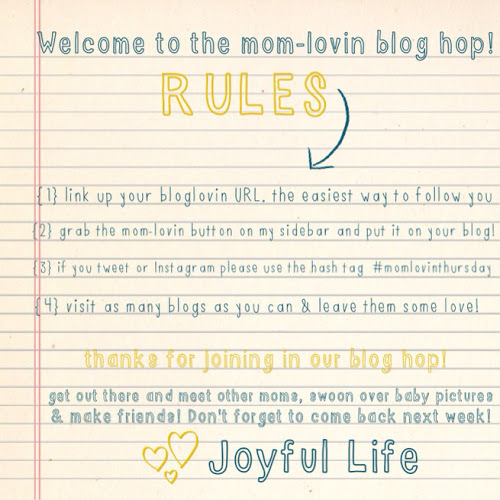 Once again I'm co-hosting with Melissa from Fawn Over Baby for Hannah at Joyful Life's blog hop! <div align="center"><a href="http://www.hannahsjoyfullife.blogspot.com" title="Joyful Life "><img src="http://i1323.photobucket.com/albums/u592/bobeterpstra1/1415c5f9-a782-4741-8cdd-7a4ec616c25d_zps8467f164.jpg" alt="Joyful Life "
Be sure to hop on over to Hannah's blog to see who she picked to feature from last week! Now pour that cup of tea and meet some fabulous mamas!